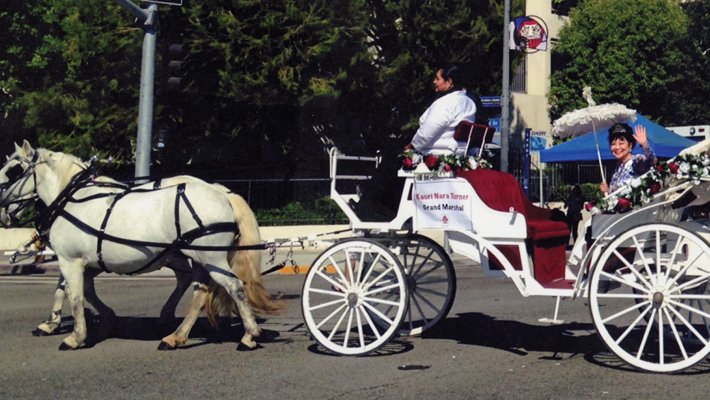 Last August, the Nisei Week Japanese Festival celebrated its 75th anniversary, and the woman honored as the Grand Marshal of the parade is a familiar figure to Local 706, make-up artist Kaori Nara Turner. Born in Tokyo, Japan, in 1933, Kaori started her career as a dancer. In 1966, she met and married well-known Hollywood make-up artist Bill Turner. Kaori not only followed her husband back to Hollywood, she also followed him into his profession. She became one the most sought-after and successful Japanese make-up artists in the American film and television industry. 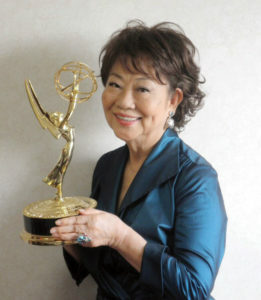 In 2003, Kaori won an Emmy® Award for Outstanding Makeup on a Television Series for her work on Alias. Other film and television projects included Flashdance, Charlie’s Angels, Planet of the Apes, Ghostbusters, Kill Bill, The Last Samurai and American Beauty. While achieving much success in her make-up career, she started pursuing another long-time ambition, that of prompting a better understanding of Japanese traditional arts and kimono. She wanted to share their beauty with the Hollywood community, and she achieved this, in part, by giving numerous lectures. Recognized as an expert in authentic Japanese kimono, she was chosen by Disney to organize and host their Japan festivals throughout the 1970s and 1980s. These events featured many of Kaori’s interests and talents, such as Japanese dance and cooking, as well as a tea ceremony, flower arrangement and calligraphy. In 2006, Kaori received The Order of the Rising Sun, Gold and Silver Rays, from the Japanese government for promoting Japanese culture and friendly relationships between Japan and the United States. Since 2007, Kaori has been instrumental in bringing Aomori, Japan’s gigantic paper floats known as Nebuta, to Los Angeles for the Nisei Week and the Japanese Festival Grand Parade. Kaori also gives her generous support to many Japanese American community organizations in Southern California, including local senior healthcare groups and national Japanese charity drive Ayumi-no-Hako.